Homely place with a bar and in-house restaurant. 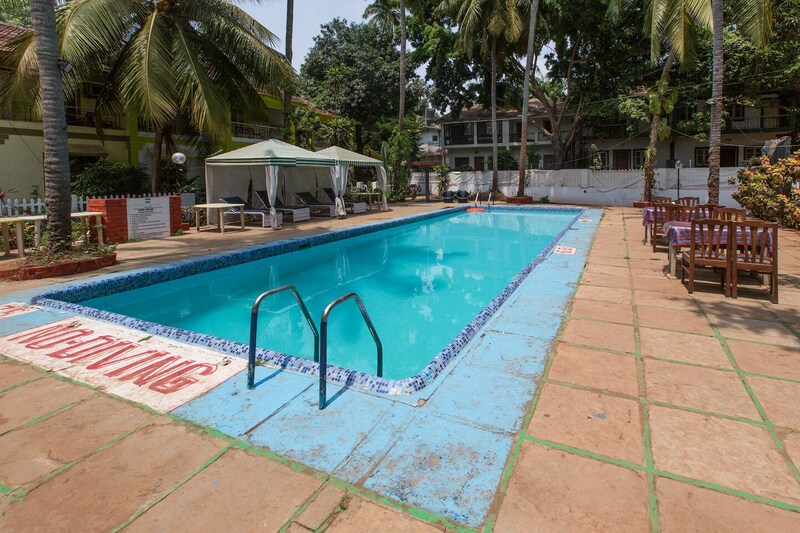 Hotel Ondas Do Mar is located in Calangute, Goa. St. Alex's Church, St. Sebastian Chapel, Museum of Goa and Shravani Temple are few miles away from the hotel.This simply presented hotel with spacious rooms, bright colored interiors, attractive wallpapers, and well-maintained washrooms is what you would get while your stay. The wall close to the bed features lamps and lights for the convenience of the guests. The various amenities that the hotel offers include swimming pool, mini fridge, hair dryer, CCTV cameras, AC, power backup, parking facility, TV, geyser, in-house restaurant, laundry and bar. Some of the nearby located restaurants include Masala and More, Navtara Calangute, Infantaria, Fishermans Cove and 10 Downing Street.